This foldable skyscraper concept was designed by Polish architects to offer relief in remote disaster zones, and has been named the winner of this year's eVolo Skyscraper Competition. The collapsable tower named Skyshelter.zip was designed by Damian Granosik, Jakub Kulisa, and Piotr Pańczyk to be delivered by helicopter. The flattened structure is designed to be packed into a box only as wide as the building's base, so it can be suspended under military helicopters. This would help aid workers access remote locations that trucks might not be able to reach if roads become impassable. Once in situ, the base would be anchored in place and a "load-bearing helium balloon" would be inserted to rapidly raise the tower. Accordion-style fabric panels used to create the external and internal walls would unfurl rapidly as the balloon rises. Lightweight 3D-printed slabs forming each floor would be pulled upwards by structural steel wires attached to the balloon. These wires would be strong enough to resist wind once the temporary skyscraper was in place. "Depending on amount of gas poured into the balloon, one can control the number of floors that are unfolding," the team explained in its competition entry. "This way, with single, mass produced module it is possible to attend different-scale, unpredictable events." Inside, the team imagined the skyscraper could host a reception area, first aid bays, temporary housing, safe and dry storage space, and even a "vertical farm that uses soil gathered during anchoring". 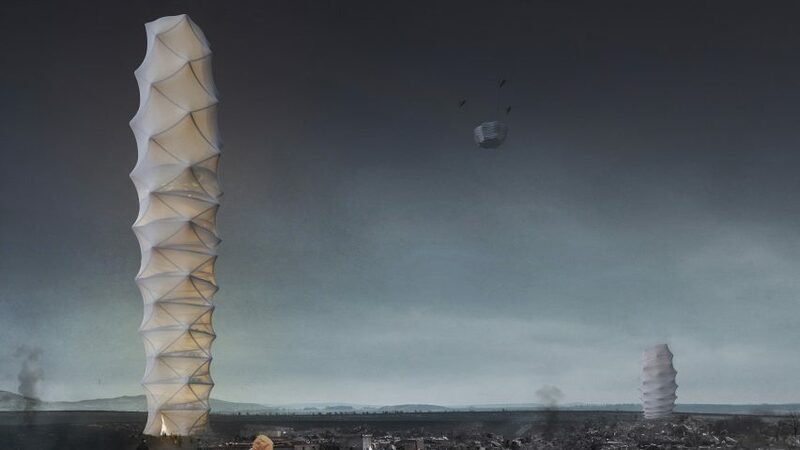 By stacking the functions of disaster relief tents on top of each other, the architects estimate the structure would take up to 30 times less room than a traditional tents or containers used in disaster relief. This would reduce the cleanup operation required to clear the ground in an area that has been hit by hurricanes, floods or earthquakes, allowing survivors to be temporarily housed near their existing communities. The team also proposed using a nano-material based on ETFE foil embedded will tiny solar panels so the tower can produce its own clean energy in case of emergency power cuts. The balloon at the top of the structure would have a hollow centre to collect and filter rainwater. Second place in this year's competition went to Hong Kong architect Tony Leung's design for a vertical hybrid shine and rice-farming complex to help integrate communities in the Ginza district of Tokyo. Claudio C Araya Arias from Chile was awarded third place with their idea for a modular skyscraper that could combat forest fires. Along with the three winners there were also 27 honourable mentions given out of a total 526 entries. Winning concepts in previous years of the competitions include a tower that could be build inside the hollowed-out trunks of giant sequoias in the US, and a modular vertical farm designed to be used in sub-saharan Africa.